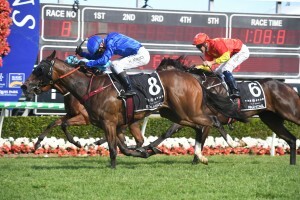 Godolphin’s first Magic Millions venture proved successful with Exhilarates storming home to win the 2019 $2m The Star Gold Coast Magic Millions 2yo Classic (1200m) at the Gold Coast today. Exhilarates, above in royal blue colours, powers home to win the 2019 Magic Millions 2yo Classic at the Gold Coast. Photo by Steve Hart. Exhilarates was the first two year old to carry the famous Godolphin royal blue colours in a Magic Millions 2yo Classic and claimed victory instantly with big race jockey Kerrin McEvoy winning another feature race. Trainer James Cummings had Exhilarates in tip top order but the race didn’t go completely to plan with the Snitzel filly settling well back in the field with two runners behind her at the 1000m mark. McEvoy didn’t panic and let the filly travel with most of the field in front of her, but started to take an interest at the 600m. McEvoy tracked Exhilarates into the race and after saving some ground on the home turn, eased the filly to the centre of track to give her a clear run to the line. Exhilarates ($4 favourite) responded magnificently and powered home down the middle of the track to overhaul Dubious ($7.50) who has slid up along the fence and looked the winner at one stage. Hugh Bowman’s mount Hightail, which had been well supported in the betting ($8 – $5.50) also made a late charge to finish third. “She got squeezed at the start, but she is experienced and seasoned and we set out to do that with her and I think that stood her in really good stead,” Cummings said. McEvoy is having a great 2018 – 2019 season and added today’s Magic Millions 2yo Classic win to his wins during the 2018 Spring Carnival on Redzel in the $13m The Everest (1200m) at Randwick and on Cross Counter in the Group 1 $7.3m Lexus Melbourne Cup (3200m) at Flemington.